I am Jenny McCullough Cosgrove @EvalNerd, Twitter convert, and member of the #EvalTwitter community. It is fascinating to watch our online community form and we are excited to introduce our #EvalTwitter monthly chat topics. This will be an easy way to connect with the #EvalTwitter and start conversations. Hot Tip: Get connected around the #EvalTwitter hashtag. Step 3. Connect and have fun! Hot Tip: Join the #EvalTwitter community for #eval chats the fourth Thursday of each month at 8:30 PM EST (5:30 Pacific) starting NEXT Thursday March 22! Each month we will connect around a specific hashtag, starting in March. Tweet out with the #EvalTwitter hashtag each month to get involved! 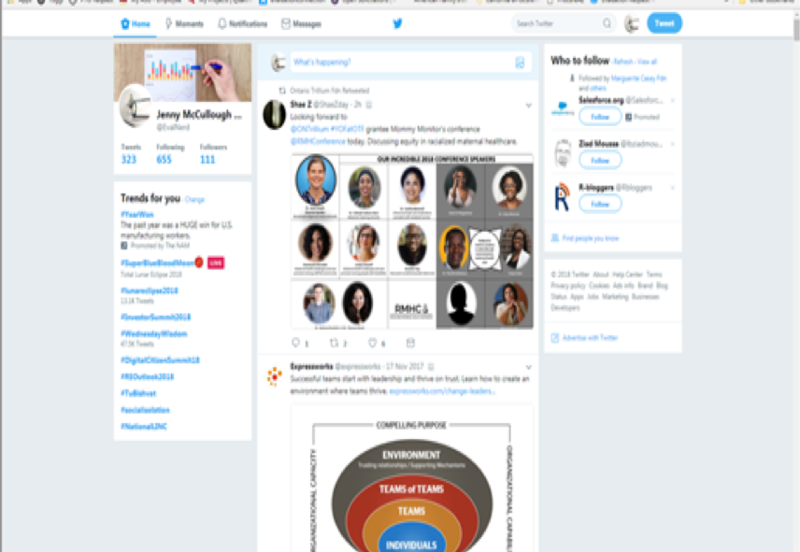 Get to know the #EvalTwitter community and connect with new evaluators. Share out your #eval loves and targets of your admiration to connect them with #EvalTwitter. No idea what a Follow Friday is? Check out this longer (and funnier) explanation by The Oatmeal. Share a method or approach that you are just crazy about! What about this method or approach excites you? Promote your local AEA area collaborative (LAC). Connect with someone new in your area. How have you failed forward in your #eval work? What great #eval thing have you done so far in 2018? Compliment a fellow #EvalTwitter-er on their great work. What has been the best professional development you have attended this year? What has been the best professional development you have ever attended? Why? Connect with an #EvalTwitter fav and schedule a coffee break with them at #Eval18. Need recommendations for a certain topic? Live tweet your conference attendance. What has stuck with you from the conference? What do you find continuing to consider? How are you going to renew your #eval practice for 2019? Where do you hope to grow in your practice in the new year? #EvalTwitter is planning a live-tweeted get-together at #eval18. Join us for an in-person get-together in Cleveland. Follow #EvalTwitter to stay in the loop. Following a live Twitter chat can be difficult, so we recommend using Hootsuite or another similar program to better engage in the chat! Applications for Hootsuite can be used to curate your own social media experience and keep up with a live Twitter chat. Check out this Hootsuite kickstart guide. Hi, my office is excited to participate in the monthly discussions! Are there any more questions, guidelines, tips, etc for this month’s methods discussion? Hi Connor! You can check out last month’s discussion by going to Twitter and searching #EvalTwitter. Feel free to DM me at @danawanzer if you have any questions. We’ll be doing the next one in a couple weeks but we’ll be posting about it on Twitter.